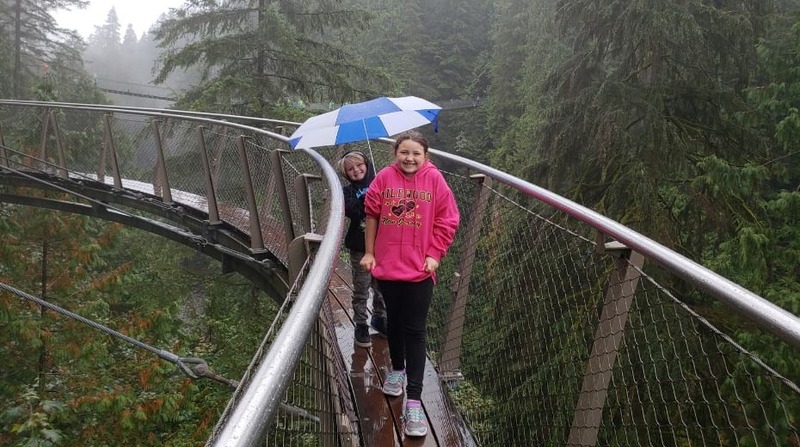 Have you ever heard of the Capilano Suspension Bridge? Honestly, I didn’t know much about it until I started planning our family vacation to Vancouver. 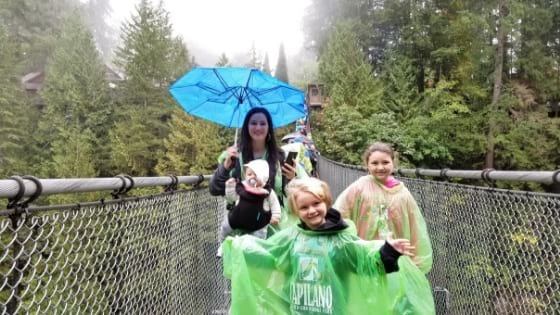 However once we discovered it, Capilano quickly became the number one Vancouver attraction we wanted to visit together as a family. 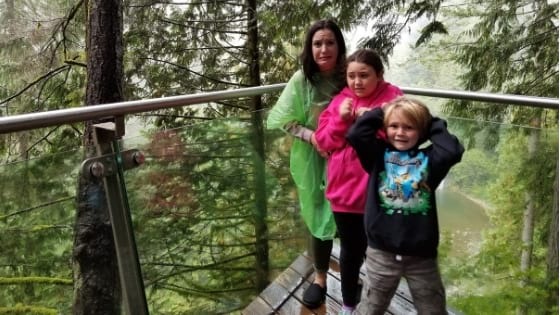 The thought of exploring the Vancouver rain forest via suspension bridge was just too enchanting to pass up – yes, even with three little kids and a scaredy-cat grandma in tow. 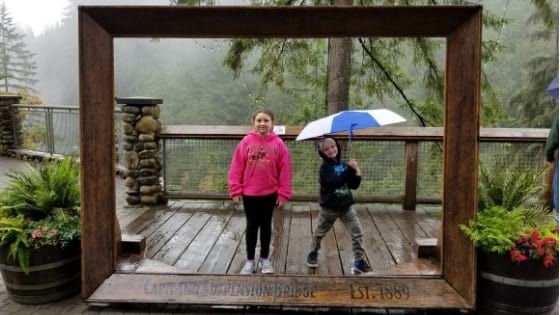 So, come rain or shine we made it a priority to visit Capilano Suspension Bridge Park. And boy, we are glad we did! 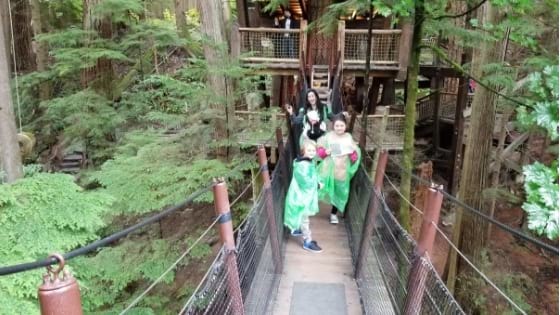 Here are some things we learned and things you should know about visiting Capilano Suspension Bridge with kids. The first hanging bridge on Capilano Canyon was built in 1889 by George Grant Mackay. He came to Vancouver, British Columbia from Scotland in 1888 and bought up 6,000 acres of the forest along the Capilano River. He built a sweet little cabin overlooking the canyon. Perhaps not surprisingly, his cabin and the Vancouver suspension bridge became a quick hit attracting his thrill-seeking buddies, who called themselves the “Capilano Tramps”. Then in 1914 a gentleman by the name of Edward Mahon purchase the land and bridge, opening a Tea House and reinforcing the Canada bridge with cables. A forest ranger, known as Mac, who also happened to be the boyfriend of Edward’s mother-in-law, started to boast the Suspension Bridge Vancouver as the eighth wonder of the world. As fate would have it, Mac later bought the bridge and in 1935 he asked the First Nations to display their beautiful totem poles around the park. Then in 1953 a man by the name of Rae Mitchell purchased the bridge and land, rebuilding the bridge, developing trails and even turning Edward Mahon’s old tea house into the Trading Post Gift Store is it today. 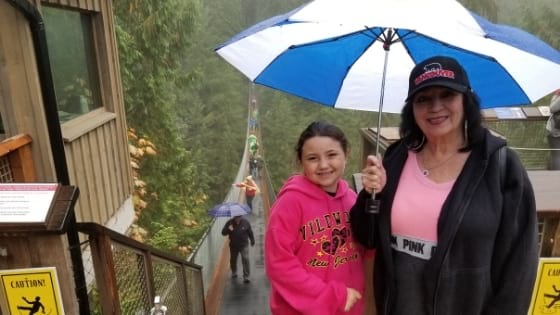 Three decades later his daughter, Nancy Stibbard, took over and brought the Capilano Suspension Bridge Park to a whole other level, making it much more than just a quick stop. The park began its transformation into the full-fledged attraction that it is today. When you first enter the Capilano Park you are greeted with the story of British Columbia’s First Nations people, who originally lived in this area around the early 1800’s. In fact, the name Capilano comes from the Squamish Nation word for beautiful river, Kia’palano. In this area of the park, visitors get to view the amazing totem poles that stand proudly across the property. The craftsmanship of these enormous totem poles is remarkable and you’ll want to stop for some photo ops. Let’s face it folks, this is the main attraction! Everyone comes to Capilano Park to cross this massive, historic suspension bridge. The Capilano bridge stretches 450-feet across the Capilano River, suspending high above the Vancouver rainforest at 230-feet. Actually, in preparation for this trip we watched several YouTube videos of the bridge to get an idea of what crossing the Capilano Suspension Bridge would be like. But let me tell you, nothing prepares you for what it is truly like in person. As cliché as it sounds, breathtaking pretty much sums it up. Just a warning, the bridge is pretty wobbly. Not dangerously so, but perhaps uncomfortably for some. For example, my mom couldn’t get her bearings and had to turn around and get off. Because it is very high and sways, it can be a bit disorienting for some. It was a little tricky for me at first too, because I was juggling a phone and umbrella and had a 20 lb baby Kent strapped to the front of me and a backpack strapped to the back. However, I did find my groove and the bridge was significantly less wobbly in the middle and that’s where the best views are anyway. Now, I am told that the bridge and park can get very crowded and I am sure that the crowds could take away from some of the magic. However, we went on a cool and rainy Vancouver morning and stayed all day until closing at 6:00pm. We had a lovely experience! The crowds actually dispersed later in the afternoon for us, so keep that in mind when you plan your trip. Once you make it across the Capilano Suspension Bridge, you can start exploring the other exciting trails. With the Treeptops Adventure you get a chance to view the Vancouver rainforest from a squirrel’s perspective thanks to a series of 110-feet high suspension bridges attached to the 250 year old Douglas Firs. The kids participated in the Kids’ Rain forest Explorer Program by completing a fun little scavenger hunt as we made our way high above the forest floor. It made the already thrilling adventure even more exciting and engaging for the kids. The Treetops Adventure empties out onto the Nature’s Edge Walk, which is a lovely tranquil trail along the forest floor. The canopies are so thick that even on a rainy day, we didn’t need to use our umbrellas! Down along the Nature’s Edge Walk is Raptors Ridge where visitors can learn about raptors and other wildlife in the area. It is chance for kids to ask questions and see some amazing creatures up-close. The Cliff Walk is located near the entrance of the suspension bridge. So, you will want to do this either before you cross the bridge for the first time or after you get back. We completed the Cliff Walk after we returned from our Treetops Adventure and after a yummy lunch at Cliff House Restaurant. Frankly, this was a bit freakier to us then the huge suspension bridge. This is the newest attraction at Capilano Suspension Bridge Park and may be the most thrilling. You literally walk along the cliff’s edge on a series of suspended narrow walkways. It is so narrow guys! You honestly feel like nothing is separating you from the canyon below. There are even sections and lookouts that are see-through and where there is visually nothing preventing you from falling hundreds of feet! The Cliff Walk Vancouver will absolutely get your heart pumping. This is cozy full-service restaurant with gorgeous views of the Capilano Canyon. Complete with a roaring fireplace, hanging candelabras and full craft cocktail bar, this place is a winner in our book! We hung out here for a long time during our visit to the park. All that adventure and rain sure worked up an appetite….and thirst, so we couldn’t wait to get snug at the Cliff House restaurant. The food was delicious, the beer selection was great and the atmosphere was everything you would want and expect for a forest adventure in British Columbia. This is nice place if you need a little warm up or quick snack. Here you can enjoy a locally roasted organic coffee, sandwich or a baked treat. My husband grabbed a coffee to go on our way out and thoroughly enjoyed it on the free trolley back to our hotel. Hot Tip: We stayed at the Century Plaza Hotel and Spa, which was super family friendly with large rooms and kitchenettes, etc. But most importantly, the FREE suspension bridge trolley and the hop-on-hop-off buses both picked up right outside the hotel, just steps from the lobby, which was super convenient. Check Photos, Rates and Availability for Century Plaza on Expedia. This is another coffee and treat stop, but it located on the other side of the Capilano Suspension Bridge. It is a fun little place to reward yourself with a hot cocoa and cookie after crossing the infamous bridge. A quick-service option, the Logger’s Grill is where you can grab a delicious Canadian sirloin or Ocean Wise salmon burger. They also have Canadian spicy bratwurst and vegetarian burgers. They also claim to use ethically-raised organic meat. You can also grab a cold beer here, too. I heard some people complain about the price of Capilano Suspension Bridge tickets. It may seem a little high at first glance, but if you consider the fact that it goes into preserving this beautiful coastal rain forest, it doesn’t seem like such a hard pill to swallow. For perspective, it is only half the price of a day at Disneyland and kids under 6 are actually free. Hot Tip: Did you know that visitors in wheelchairs are also offered free admission as they cannot participate in the park attractions, such as the suspension bridge, cliff walk and treetops adventure. I guarantee they will still have a lot of fun experiencing the rest of the park. There is a free Capilano Suspension Bridge shuttle. It picks up in various points around the city of Vancouver, making it super convenient for visitors. We took the shuttle from Century Plaza Hotel, where were staying during our trip. Hot Tip: The schedule and route changes from season to season, so be sure to check their site HERE for up-to-date information to catch the free Capilano Park shuttle. 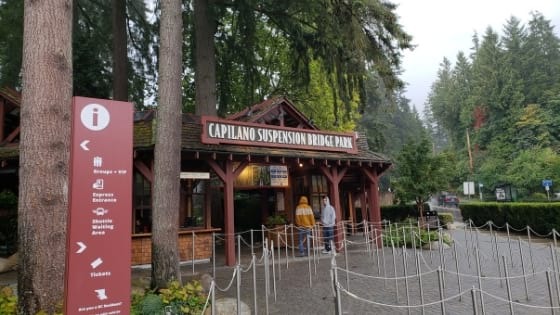 I can not imagine anybody visiting Vancouver without spending a day at Capilano Suspension Bridge Park. 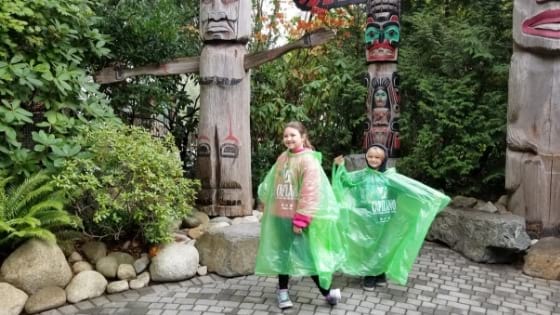 It was definitely the highlight of our trip to Vancouver with kids and is one of the most unique and adventurous things we have done together as a family – and (as you know from reading our blog), we’ve done quite a bit (e.g. on our 60 day road trip across US). 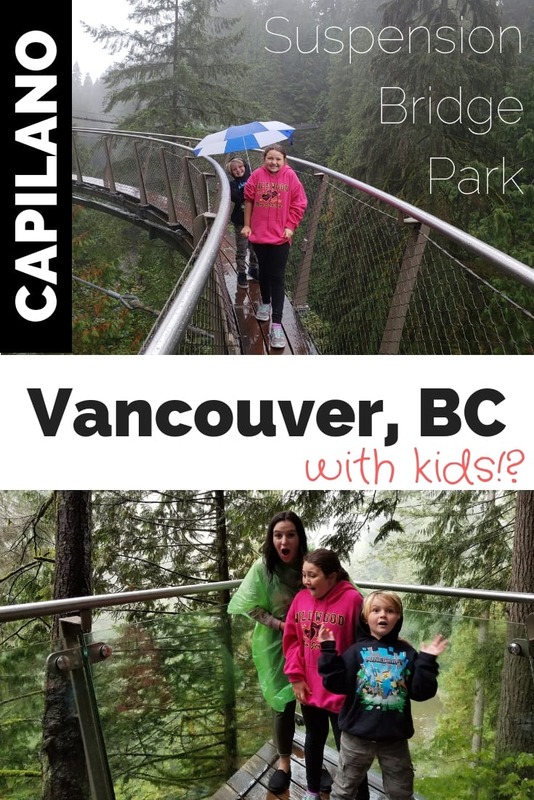 Needless to say, come rain or shine, you and your family will have an epic adventure at Capilano Park. I had never even heard of this place, but now I really want to go! I didn’t know about it until we were planning our trip and it was totally awesome. This looks like something you would find in Costa Rica—you have totally blown my mind. I am LOVING this. I have heard wonderful things about Vancouver and now I am a little bit hankering to book a trip out there. Thanks for sharing! Thanks for the comment and you’re welcome Brandy! If you pull the trigger and plan a trip, let me know if you have any questions about our visit there. Also, we will be posting a larger post on things to do in Vancouver with kids sometime soon, so keep checking back with us too! Everything good you’ve heard is true. We loved Vancouver and can’t wait to go back. Yeah it was incredible in person.